The importance of getting it right when introducing a baby to solid foods, cannot be emphasised enough. Prachi Grover asks the experts for their advice on one of the key decisions parents need to make when it comes to laying the foundation for healthy eating habits – whether homemade baby food is better. As new parents, there are several moments in a baby’s growth that one treasures. Their first smile, their first word, the first time they learn to hold their neck straight and many more. And the first time they eat solid food is undoubtedly one such defining moment. But like every other decision that young parents have to make, this too comes with its exhaustive list of doubts. What foods should one begin with, how should they be cooked, salt or no salt, and most importantly in an ever-busier world, is it OK to feed your kid store bought baby food? After all, research suggests that what a child eats in the first three years pretty much lays the foundation for the rest of their lives. Nutritionist Kaya Peters has the opposite view. “I strongly believe anything that comes from a jar cannot be as healthy as the fresh food you would make at home. Cooked food of course loses its nutritional value over time, so I would strongly recommend making fresh food each time – unless you are on the go or really short on time. A mashed banana, boiled and mashed broccoli or a well cooked and puréed sweet potato doesn’t take time,” she says. 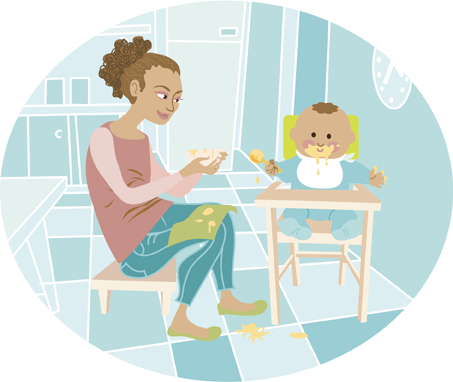 According to most experts, babies are ready to eat solids when they can sit up with support, have good control of head and neck, put hands or toys in their mouth and show interest in food by leaning forward or opening their mouth when it is time to eat. The ideal time for starting baby foods is between four to six months of age. Once you’ve established your baby is ready for solids, the challenge is to find a healthy balance between a homemade meal and store bought food and more importantly, finding a way where making a meal for your baby doesn’t become a tedious and a monotonous chore but a pleasure. Deconstructing the meal that you are making for the rest of the family is an easy way to do this. Making a shepherd’s pie for the family? Before you add the boiled potatoes to the pie, keep one for your baby and make a potato mash. Making a broccoli stir fry with sesame seeds? Before you add the spices, take out a floret or two for the little one and mash it up. Making a brown rice and kale salad for lunch? Take out your share out of the pan and leave baby’s portion in to cook for longer to make it soft enough. The possibilities are endless. If the baby’s meal start coming out of the main meal, not only does your workload decrease, but as they are eating what the others are, they begin to enjoy meal times more. When it comes to introducing new foods, the rule of thumb is to let baby get used to one new food for about three-four days to check for negative reactions, if any. “Many mothers worry when babies refuse solid foods after one or two attempts. If that happens, do not force down foods, instead try a different type of food,” suggests Dr Bahauddin. “Sometimes it can take eight to ten encounters with a particular new food before the baby will actually eat it. Other foods to avoid include cow’s milk until they turn one, and anything that can cause choking, like nuts and grapes. Red meat is also a no no, because the protein might be difficult for babies to digest until they are older. Do not keep homemade food in the fridge for more than a day. Do not freeze in bulk, always freeze one portion at a time, and use within one month. Do not defrost at room temperature as that promotes bacterial growth. Always defrost in the fridge, double boiler or microwave. Do not refreeze or restore defrosted foods. Do not overheat food. When using a microwave, it is important to mix food thoroughly and check the temperature to avoid overheating and burning the infant’s mouth. “Introduction of solid foods is an important milestone and an exciting time for both parents and the baby,” says Dr Bahauddin. “Ultimately the decision to give home cooked meals to babies is determined by the parents’ desire and ability to prepare meals and also the cultural practices they are accustomed to.” However, the evidence in favour of giving them home cooked food, whenever possible, is certainly irrefutable. Note: When introducing any vegetable or fruit for the first time, don’t try a combination, so that any potential allergies can be easily identified. Previous Post&LeftArrow; Previous Eat to boost fitness!